Since Facebook made the announcement about the changes coming to News Feed, teams have quickly-organized strategy meetings and experienced a range of emotions from resignation to pure panic. 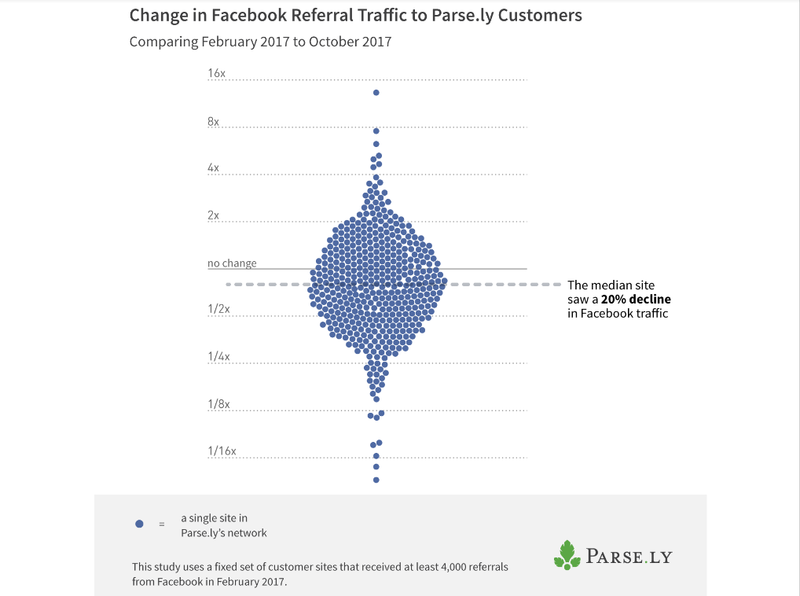 The trend of Facebook’s declining referral traffic back to publishing sites isn’t new, we saw it happen throughout all of 2017. But with the explicit announcement from Facebook, including a follow-up that they would be asking users to rank publishers’ trustworthiness, the industry as a whole has decided it needs to brace for what’s coming next. As of January 20, our network shows 23% of external referral traffic coming from Facebook, which has stayed roughly consistent over the past month. According to Mark Zuckerberg’s post, “After this change, we expect news to make up roughly 4% of News Feed — down from roughly 5% today.” Since readers must see publishers’ stories and posts in order to click and become referred traffic, going from 5% to 4% for two billion people could result in additional declining traffic. Facebook’s shifting the tides of the media landscape. And we want to help the industry. We’re offering assistance through data to help clarify your risk relative to other publishers, regardless if you’re a Parse.ly customer or not. See our top three tips below and find out more about getting our free Facebook Risk Exposure Assessment. 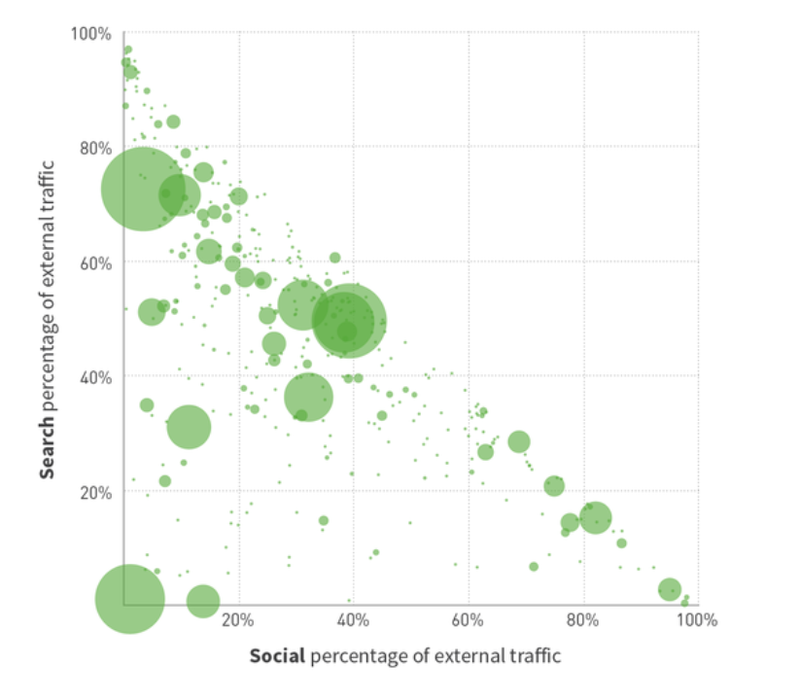 The decline of Facebook as a referral source in our network captures the aggregate data, but it’s not the full picture. If you’re taking stock of your risk and strategy in light of these announcements, here’s what else you need to consider. Yes, Facebook volume has been decreasing. But it hasn’t been decreasing at the same rate for all publishers. For some, it has actually been increasing during that same time period. And while we encourage teams to prepare for changes, so far we haven’t seen any indications of a Facebook “cliff,” rather an ongoing overall decline that had been happening almost all of 2017. Know how your organization relates to that trend. The amount of search and social referrals that each publisher receives varies widely under that rolled up aggregate number. Within a sample of our publisher network, you can see how the exposure to Facebook as the main source of referral traffic ranges. The publishers further to the right of this graph are those most at risk. Now that readers will be telling Facebook how trustworthy they think you are, how can you assess how they feel already? Beyond search and social traffic, understanding your most loyal readership offers an indication as to how strongly people feel about your site. Evaluating sources that drive internal referrals and direct traffic through apps or newsletters can pinpoint areas that could be worth investing more in if Facebook traffic continues to decline. For any publisher that requests it, we’ll provide a free Risk Exposure Assessment Profile. We’re confident that this information can assist publishers who may be seeing a decline from Facebook, but also the industry at large as we decrease the dependency on the News Feed and increase the engagement that audiences have with your content directly. Sachin Kamdar co-founded Parse.ly in 2009 with former NYU roommate Andrew Montalenti. Sachin speaks around the world on how companies can incorporate data and analytics into their content and audience strategies. When not running Parse.ly, he is a mentor for Entreprenuers Roundtable Accelerator, he sits on an advisory board for the University of Florida‘s Audience Analytics program, and he tutors students. Sachin has bachelor’s degree in Economics from NYU and a master’s in Education from Pace University. He enjoys listening to live jazz, exploring Brooklyn with his wife and their dog, Jamba, and never having a steady sleep schedule.